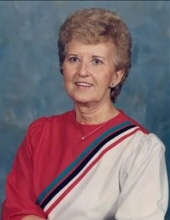 Audrey Crump, of Jasper, passed away Saturday, March 30, 2019 at WellStar Kennestone Hospital. She was survived by her sister, Elsie Cox of Jasper; brother and sister-in-law, Sam and Jerrie Silvers of Jasper; brother-in-law, Jim Dean of Jasper; special daughter and son-in-law, Monica and Clyde Cody of Jasper; special granddaughter, Nicole McArthur of Jasper; several nieces, nephews, great nieces and nephews along with great-great nieces and nephews. Mrs. Crump was preceded in death by her husband, JT Crump; brothers and sisters, Charles Silver, Clent Silver, Goldavee Davis, James Silver and Ruby Dean; mother and father, Malva and Grady Silver. The family will be receiving friends at Roper Funeral Home on Sunday, March 31 2019 from 1:00 p.m. until 7:00 p.m and on Monday, April 1, 2019 from 9:00 a.m. until the funeral hour. Funeral Services will be held Monday, April 1, 2019 in the Roper Funeral Home Chapel at 11:00 a.m. with Reverend Harold Cantrell and Brother David Jones. Interment will follow in the Ball Creek Baptist Church Cemetery. To send flowers or a remembrance gift to the family of Audrey Crump, please visit our Tribute Store. "Email Address" would like to share the life celebration of Audrey Crump. Click on the "link" to go to share a favorite memory or leave a condolence message for the family.